Fully automatic CD + DVD production runs up to 100 CD / DVD! You know the situation. You simply want to burn and print a few CDs/DVDs  and suddenly half the day’s gone. It shouldn’t be this way. And it doesn’t have to be  the fully automatic Epson Discproducer PP-100 can do it for you at the touch of a button. Whether you want just one disc, or one hundred, you’ll find it delivers reliable data burning and photo-realistic printing  quickly, efficiently and extremely cost-effectively. For many companies, the need to burn and print CDs and DVDs, either individually or in batches, is becoming increasingly important. Whether you’re an agency, a public organisation or an independent duplication service, you’ll find the Epson DiscProducer PP-100 will save time, add flexibility, enhance security and reduce process costs. The Epson DiscProducer is the perfect tool for maximising margins in the rapidly growing media production market. Whether you want to use it for an individual disc or a batch job, its high reliability, superb print quality and cost-effectiveness make it the ideal system for service providers. The switch from analogue X-ray or CT film to digital imaging offers new possibilities for cutting process costs and improving patient service. In areas such as radiology, cardiology, ultrasound and CT imaging, the medical community can supply a better service to its patients through the use of digital data. Increasingly, sectors such as marketing, sales, product development and customer service need to burn multimedia documents onto CD/DVD. But manual burning and labelling of CD/DVDs  especially short runs  carries a significant labour overhead. 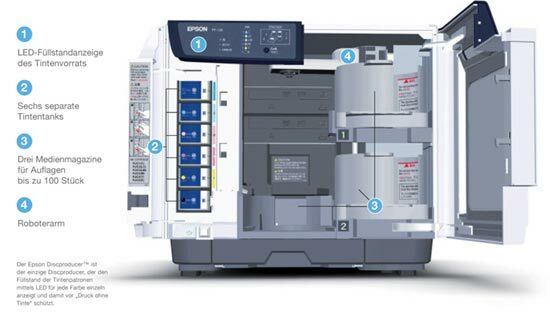 Automating the procedure using the Epson Discproducer saves considerable time and money, while ensuring that confidential data stays in-house. More infos and prices here! When you build industrial robots, you learn about quality, reliability and precision engineering. And Epson is a world-leader in the design, development and manufacture of such robots as for medical technology and airbag testing. That’s why our other products are so reliable  because they are built on the platform of knowledge and experience gained from the robotics environment. The Epson DiscProducer is a perfect example. Its compact design, coupled with its dust-proof body and a minimum of moving parts, delivers precision performance, superb reliability and amazingly low running costs. 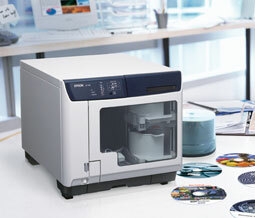 If you need to burn and print an individual disc, no problem  you can have it at the touch of a button. And if you want to print batches? Again, it’s simple  the Epson DiscProducer has three trays for 50 discs, allowing up to 100 discs to be produced in one work cycle. It also has an additional drawer for up to 5 discs, so individual CD/DVD blanks can be conveniently removed without having to open the housing. 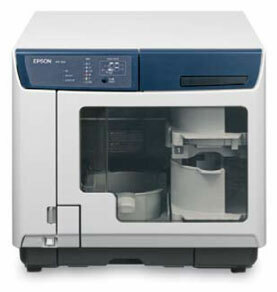 With a housing that’s less than 40 cm wide, the Epson DiscProducer is one of the smallest systems in its class. In fact, it’s the only system in its segment that offers the ergonomic advantages of being operated totally from the front. Its flat housing means you can stack two systems to save space, and  if required  the top can also be used as a handy storage surface, ideal for media and print cartridges. Specially designed for the Epson DiscProducer, the AcuGrip mechanism ensures that the robotic arm reliably grabs only one CD/ DVD blank - even if they’re stuck together. This increases the life of the product and helps protect against the interruption of unsupervised production runs due to mechanical blockage. HANTZ + PARTNER has over 15 years experience in production and selling of CD + DVD copying systems and offers these systems among other things in Germany, Austria, Switzerland, France and Spain. Wolfgang Hantz, CEO of HANTZ + PARTNER: “During others, also many larger distributors or online shops only somehow sell, offer we to our customers security and experience of an enterprise, which has the products in the own, daily productive employment". Further information to these systems to find you under www.CDRobots.com or www.hantz.com.